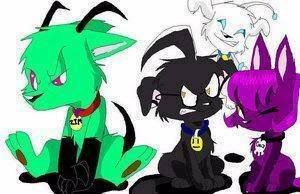 invader zim GIR gaz anddib as puppies!!!!!!!!!!!!!!. . Wallpaper and background images in the Invader Zim club. i drew this mi self mi sis let me borrow her photoshop i hope u like it oh and plese be mi fan!!!!! ITS LIKE PERFECT!!!!!!!!!! YOU SHOULD BE SOOPER PROUD OF URSELF!!!!!!!!! Aww I love the hate I see in the picture. To cute... I must save this and put it as my backgroud!